During 25 year storm events, rainwater overtops the lower section of Highway 26, one of the major routes tourists use to access Yellowstone National Park. In 2011, for example, storm water overtopped the highway causing major damage to the downstream side of the roadway, nearly washing out the entire highway from Riverton to Dubois, Wyoming. It was imperative a resolution be found, so Wyoming Department of Transportation (WYDOT) turned to Contech Engineered Solutions, Inc. for help. 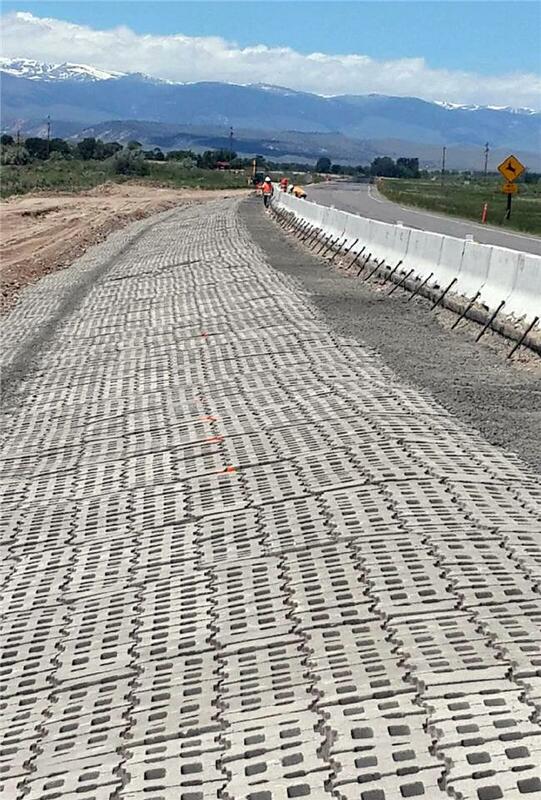 After consultation with engineers at Contech, WYDOT personnel decided that the best solution to protect the roadway embankment during future storm events was to install 26,400 square feet of ArmorFlex® Class 50T tapered articulating concrete block mats. WYDOT used a performance-based specification that required block design and sizing be determined using results from testing per ASTM D7277. ArmorFlex proved to be a more cost effective alternative to conventional riprap, while also being safer than riprap were a vehicle to leave the roadway. "The ArmorFlex blocks were chosen because they were placed within the clear zone of the traveling public," stated Robert Schneidemantel, Resident Engineer with WYDOT. "They provided a smooth transition from the roadway along the slope where they were buried at a depth of 3-6 inches. This also allowed us to protect the slope if any future flooding occurs." Once the subgrade was prepared and compacted, the ArmorFlex mats were installed over the course of two weeks using an excavator. Overall, WYDOT was satisfied that ArmorFlex was the best solution for this project because it met the overtopping design objectives and was cost effective both in initial material costs and installation time.